The Coen Brothers' latest venture Hail, Caesar! is packed with stars like Josh Brolin, George Clooney, Scarlett Johansson, Channing Tatum, and Ralph Fiennes — you know, just to name about half of the cast — but the actor who everyone is talking about is Alden Ehrenreich, who plays fictional 1950s western film star-hilariously turned-romantic leading man Hobie Doyle. Ehrenreich infuses the impossibly sweet Doyle with an genuine earnestness that makes him instantly likable — particularly when Doyle tries so desperately tries to nail the line "Would that it 'twere so simple," much to esteemed director Laurence Laurentz' (Ralph Fiennes) dismay. It is this scene that not only reveals Ehrenreich's inherent comedic chops, but is also the moment of realization for the audience that he can hold his own with veteran actors. 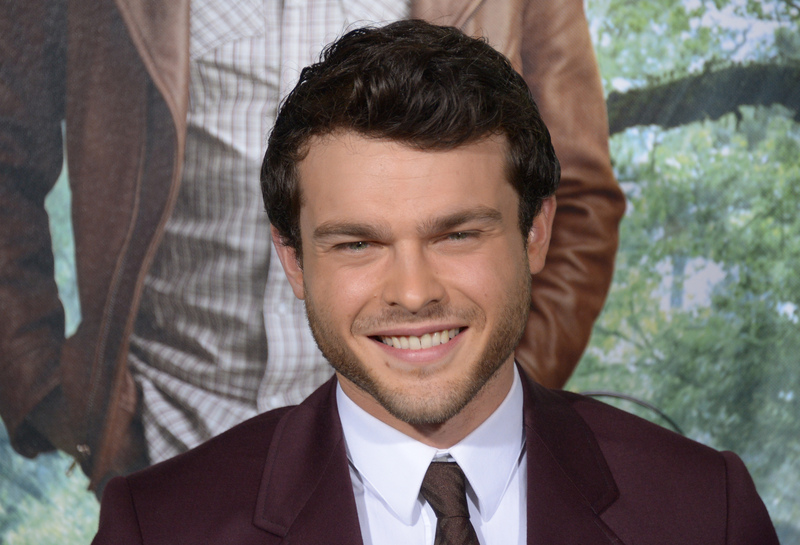 So, who is Alden Ehrenreich? It's a question you'll probably only ask yourself this once, because the actor is well on his way to becoming a household name. This is a legit thing that happened. According to Rolling Stone, a 14-year-old Ehrenreich and friends made a silly film for a friend's Bat Mitzvah. Little did Ehrenreich know that the gag would change his life, particularly because Steven Spielberg was at the party, saw the film, and immediately knew the actor had talent. "It's a piece of sh*t," Ehrenreich said when telling the story of the Bat Mitzvah movie to Rolling Stone. "It's a video that this girl asked us to do. I mean, there wasn't a script: We would go and just film whatever made us laugh. I'm this 14-year-old, skinny little kid with long hair. I break into her house, try on her clothes and make up a song. All of this is just us literally taking a camera and going like, 'OK, ha ha, do this.' We showed it to our parents — 'We're gonna play this at her bat mitzvah!' — and they were like, 'You look like an idiot in this. I don't think you should really do that.' We didn't care." While doing press for Beautiful Creatures, Ehrenreich revealed that it's not just his characters who have romantic sides to them — the actor is pretty much Human Version of the Heart-Eye Emoji himself. "My first girlfriend and I went to the top of a billboard and kissed on top of a billboard ... on the Sunset Strip," he said of the most romantic thing he's ever done. Melt. "We had a guy whose dad and him used to do a routine together. His name’s Cliff McLaughlin, and his dad is a really famous trick roping guy, and they have a place," Ehrenreich told ScreenCrush about the prep that went into those lassoing moments. "So I would just drive up to their place and hang out at the house. It was great." Ehrenreich spent several years at NYU, but didn't graduate. Still, his time doing theater in New York brought the actor a lot of joy — he even started his own theater group called The Collectin, where he and theater friends (actors, directors, playwrights, etc.) would meet and perform. "That was one of the most rewarding experiences I had when I was in New York," he told the Wall Street Journal. The Coen Brothers' Hail, Caesar! may have given Ehrenreich his breakout role, but the actor is familiar with working with top-notch directors, like Woody Allen on Blue Jasmine and Francis Ford Coppolla's Tetro, Ehrenreich's first film. Still, he knew he had everything to learn from Joel and Ethan Coen. "At the end of the day, I’d say ‘Mind if I just stay?'" he told WSJ . "It was a choice between watching two of the greatest directors of all time direct these wonderful actors, or, just sit at my apartment. Why wouldn’t I stick around and watch?" Easily, the same could be said about his performance — especially because Alden Ehrenreich is pretty easy on the eyes.